Patrick Wigle is an attorney at Waters Kraus & Paul in the firm’s Dallas office. Patrick concentrates his practice on representing plaintiffs involved in product liability and toxic tort cases. His work includes helping people who have been injured by asbestos exposure and their families seek recovery through the legal process. Patrick earned his bachelor’s degree from the University of Texas at Austin. He was awarded his Juris Doctor degree from Southern Methodist University School of Law. In 2008, he was admitted to the State Bar of Texas. In 2017, he was accredited by the Department of Veterans Affairs (VA). 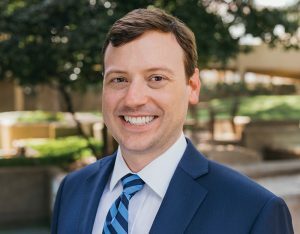 Patrick is a member of the Dallas Bar Association, the Dallas Association of Young Lawyers, the Dallas Trial Lawyers Association, the Texas Bar Foundation, the Texas Trial Lawyers Association, the State Bar of Texas, and The National Trial Lawyers: Top 40 Under 40, an invitation-only honor. He also serves as a board member for the Texas Youth Scholarship Organization. Patrick holds a Martindale-Hubbell AV Preeminent rating and has been selected for recognition on the Texas Super Lawyers Rising Stars list for the past seven years. His name has additionally been included on the Top 100 Up-and-Coming Texas Rising Stars list for the past two years. Patrick was also selected as an Associate Member of the Patrick E. Higginbotham American Inn of Court for the 2011 to 2012 term.